The Dublin City Council’s Beta Project is inviting people to have their say on how illegal dumping can tackled. 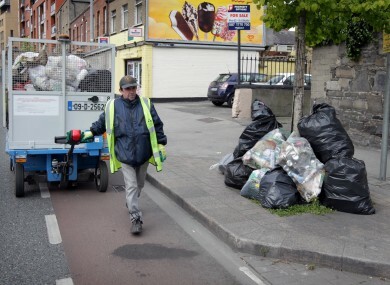 A Dublin City Council employee pictured near illegal rubbish. IF YOU HAVE despaired at the appearance of illegal rubbish on the streets of Dublin city, then you have probably wondered if there was something you could do about it. You may think that all you can do is to wait for a clampdown to take place, but now people are being given the chance to submit their ideas to help tackle the issue, and the most workable ideas will be trialled in the capital. This is thanks to the Dublin City Beta Projects, which is run by a Dublin City Council architect, Shane Waring. About 4,500 bags are currently illegally dumped on the streets of Dublin city every week, and it is costing Dublin City Council €675,000 a year to deal with this. According to the Beta Projects, there are a number of reasons for illegal dumping, including people not being able to pay for their waste, people putting out waste on the wrong day, people choosing not to pay for their waste, and people not realising they have to pay for their waste. Currently, if a bag is untagged then the private waste operators do not collect it. It is also not collected by DCC waste staff, and instead is left as evidence for the litter wardens. Around 20 – 25 per cent of dumped bags are searched by the litter wardens, and about 10 per cent of these will have information leading to the dumper. Around 5 per cent, which have the address of the dumper, are brought to court, but the people are often not charged due to individual circumstances and various legislation. This can be demoralising for City Council staff, who in some cases have spent years searching for information on the illegal dumpers. CCTV isn’t generally satisfactory as a solution, for a number of reasons. Dublin City Beta doesn’t expect there will be one solution to this, as the illegal dumping is due to many factors. But this means there can be many factors that will bring together a solution. Rather than focusing on things such as fines or punishment, the public is being asked to think of positive ways and suggestions for how the issue could be tackled. You are invited to leave your comments here on the blog, via Twitter or Facebook. All of the suggestions will be looked at and then will be put through the Beta process. The projects which are decided upon will be trialled in a specific area of Dublin – a ‘geographical sandbox’, if you will. Ideas might be combined, or improved upon. If you have lived in Dublin all your life; if you are new there; if you are from a different country and city; all of your suggestions are welcome, said Waring. Email “How you can help solve the illegal dumping problem in Dublin”. Feedback on “How you can help solve the illegal dumping problem in Dublin”.